For the rhythm and blues and classic country music song, see I Can't Stop Loving You. "I Just Can't Stop Loving You" is a 1987 duet ballad by Michael Jackson and Siedah Garrett, and was the first single released from his seventh album, Bad. The song was written by Jackson, and co-produced by Jackson and Quincy Jones. It reached #1 on the Billboard Hot 100, R&B and adult contemporary charts, making it the first in a string of 5 No. 1 singles from the album. The song became the first of five consecutive number-one Hot 100 singles from the Bad album. It was Jackson's second number-one song on the AC chart (his first, coincidentally, had also been a duet: 1982's "The Girl Is Mine" with Paul McCartney). It was released without an accompanying music video. The presence of Garrett on the track was a last-minute decision by Jackson and Jones, after Jackson's first two choices for the duet, Barbra Streisand and Whitney Houston, both decided against participating. Garrett, a protégé of Jones's who co-wrote another song on Bad, "Man in the Mirror", did not know that she would be singing the song until the day of the recording session. It became her first hit since Dennis Edwards' 1984 song "Don't Look Any Further". Jackson and Garrett later recorded "Todo mi amor eres tú", a Spanish-language version of the song, with lyrics translated by Rubén Blades, and "Je ne veux pas la fin de nous", a French-language version, with translation by Christine "Coco" Decroix. All three versions are featured on the 2012 reissue album Bad 25. The original English-language version was re-released as a single in 2012, as part of the Bad 25 release. For the duet ballad "I Just Can't Stop Loving You," Michael Jackson wanted to share vocals with Barbra Streisand or Whitney Houston. Both singers took a pass on the invitation. The co-duet duties were given to Siedah Garrett who had previously dueted on former Temptations member Dennis Edwards' "Don't Look Any Further." Garrett first came to the attention of producer Quincy Jones after auditioning for and winning a spot in the group Deco. She later signed as a recording artist with Jones' Warner Bros.-distributed Qwest Records. The singer was constantly sent song demos including one for "I Just Can't Stop Loving You," though she didn't know that the demo was a song written and sung by Jackson. While reporting for a recording session, Garrett thought that she was summoned to do overdubs for a song she'd co-written titled "Man in the Mirror." Instead she was surprised to learn that she'd been chosen to sing a duet with Jackson. To some, the wispy ballad was reminiscent of Jackson's Motown classic "Got to Be There." The original album version of the song opened with Jackson cooing a spoken intro backed by a longer version of the opening music. According to Jackson, he recorded that part of his song while lying in bed. The intro went, in part, "I just want to lay next to you for a while. You look so beautiful tonight... A lot of people misunderstand me. That's because they don't know me at all. I just want to touch you and hold you..." This intro was mixed out on the 7" single, on future releases of Bad and on most compilation albums. An alternate version of the single, featuring the original mastered album version mix with the spoken word intro for "I Just Can't Stop Loving You" backed by the album outtake "Don't Be Messin' 'Round", was released in select Walmart stores in 2012 to mark the release of Bad 25. "Churls may bemoan 'I Just Can't Stop Loving You,' Jackson's duet with the often indistinguishable Siedah Garrett, as a second unworthy entry. Without descending to musical McCarthyism and questioning the honor of anyone who can fault a record with both finger snaps and timpani, it need only be asked, Who, having heard the song at least twice, can fail to remember that chorus?" "I Just Can't Stop Loving You" was the lead single from Jackson's much-anticipated Bad album. The single debuted on the U.S. Billboard Hot 100 singles chart at #37, the week of August 8, 1987. The single was the highest debuting single of 1987, and quickly traveled to the top quarter of the Hot 100, advancing to #16 in its second week, and soaring to #1 in its seventh week on the tally, the week of September 19, 1987. Despite the success, the duet had a relatively short chart run and fell out of the top 40 just five weeks after topping the chart, spending a total of 11 weeks in the top 40. This was largely due to the quick release of the album title track as the second single (it debuted on the Hot 100 at #40 in the same week that "I Just Can't Stop Loving You" hit number one). Billboard ranked it as #43 on the year-end Hot 100 chart for 1987. The track spent three weeks at number one on Billboard's Adult Contemporary singles chart, becoming the second and last Michael Jackson single to top that chart. In the United Kingdom, the song reached #1 on the UK Singles Chart for the week of August 11, 1987 and ranked #30 on the year-end UK tally. In his autobiography, Moonwalk, Jackson stated the song was not written with someone in mind, but that he had been thinking of someone when singing the song live. Jackson performed the song on his Bad World Tour with background singer Sheryl Crow and on his Dangerous World Tour with Siedah Garrett. He also performed the song at the Royal Concert in Brunei with Marva Hicks. Live versions of the song are available on the DVDs Live at Wembley July 16, 1988 and Live in Bucharest: The Dangerous Tour. Jackson would have performed it on This Is It with Judith Hill, but the concert series was canceled due to his sudden death. However, this is a featured song in the movie Michael Jackson's This Is It. As a tribute to Jackson, Hill recorded and released a "sequel" to the song, entitled "I Will Always Be Missing You". "Can You Feel It/Don't Stop 'Til You Get Enough/Billie Jean/Black or White (Immortal Version)"
(2012) "Don't Be Messin' 'Round"
On June 5, 2012, to celebrate the 25th anniversary of Jackson's Bad album (on which "I Just Can't Stop Loving You" appears), the single was re-released to Walmart stores in the United States, but was denied a digital release. The single included the original 1987 edit of "I Just Can't Stop Loving You," which included the spoken word intro that was removed from current versions of the Bad album, as well as "Don't Be Messin' 'Round," an untouched demo that was recorded for the album in 1986. 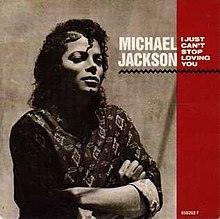 On Billboard''s Hot Singles Sales Chart, which ranks the best-selling physical singles of the week, "I Just Can't Stop Loving You" debuted at no. 1 with 5,000 copies sold. This gave Jackson his first no. 1 single on a Billboard chart since 2003, when "One More Chance" spent three weeks atop the Hot R&B/Hip Hop Singles Sales Chart. The vinyl single was released in USA on June 26, 2012. In 1988, American pianist David Benoit included a version of the song on his album, Every Step of the Way. In 2001, Gloria Estefan & James Ingram performed the song in Michael Jackson: 30th Anniversary Special. Contemporary jazz guitarist Chuck Loeb (pronounced Lobe) presented his rendition from his 2002 album "My Shining Hour." In 2009, the top 8 finalists of Latin American Idol performed the Spanish version "Todo mi amor eres tú", directed by Jon Secada as a tribute to Michael Jackson. In 2012, Lea Michele and Cory Monteith performed the song in the Glee Michael Jackson tribute episode. In 2012, Italian jazz trumpeter Enrico Rava released a version on his tribute album Rava on the Dance Floor. In 2013, Toby Love covered the Spanish version of the song in bachata as the second single from his album Amor Total. His version reached number one on the Billboard Tropical Songs chart and in the Dominican Republic. Love's cover led to Rubén Blades receiving the ASCAP Latin Award on the Tropical category in 2014. ^ Hyatt, Wesley (1999). The Billboard Book of #1 Adult Contemporary Hits (Billboard Publications), page 324. ^ a b c d Hogan, Ed. "I Just Can't Stop Loving You | Allmusic". Allmusic. Rovi Corporation. Retrieved 2013-03-25. ^ a b Cromelin, Richard (August 31, 1987). "Michael Jackson has a good thing in 'Bad'". Los Angeles Times. Retrieved 2013-03-25. ^ Sigerson, Davitt (2001). "Album Reviews: "Bad"". Rolling Stone. Wenner Media LLC. Retrieved 2010-02-07. ^ a b "Michael Jackson - I Just Can't Stop Loving You - Sony Music Entertainment Germany GmbH". Archived from the original on 2012-08-14. Retrieved 2013-03-25. ^ a b "Weekly Chart Notes: Carly Rae Jepsen, Michael Jackson, Eric Church". Billboard.com. 2012-06-16. Retrieved 2012-06-20. ^ "Alan Jackson Scores Top Debut on Billboard 200, Adele's Back at No. 1". Billboard.com. 2012-06-13. Retrieved 2012-06-26. ^ "I Just Can't Stop Loving You (VINYL): Michael Jackson: Amazon.co.uk: Music". Amazon.co.uk. Retrieved 2013-03-25. ^ "I Just Can't Stop Loving You / Baby Be Mine: Music". Amazon.com. Retrieved 2014-03-30. ^ "I Just Can't Stop Loving You: Michael Jackson: Amazon.de: Musik". Amazon.de. Retrieved 2012-06-04. ^ "I Just Can'T Stop Loving You: Michael Jackson: HMV Japan:". hmv.co.jp. Retrieved 2012-06-06. ^ "My Shining Hour overview". Allmusic. ^ "YouTube". YouTube. Retrieved 2014-03-30. ^ "Tropical Songs - Week of April 13, 2013". Billboard. Prometheus Global Media. Retrieved 2013-04-13. ^ "Latin Hits". Monitor Latino. RadioNotas. Archived from the original on 2013-03-26. Retrieved 2013-03-25. ^ "22nd Annual El Premio ASCAP 2014". ASCAP Latin Awards. American Society of Composers, Authors and Publishers. 2014-03-18. Retrieved 2014-03-20. ^ a b Craig Halstead, Chris Cadman (2003). Authors On Line Ltd (ed.). Jacksons Number Ones. p. 66. ISBN 978-0755200986. ^ "I just can't stop loving you in Canadian Adult Contemporary Chart". Library and Archives Canada. Retrieved 20 June 2013. ^ "I just can't stop loving you in Canadian Top Singles Chart". Library and Archives Canada. Retrieved 20 June 2013. ^ "CANOE - JAM! Music - SoundScan Charts". Jam.canoe.ca. Archived from the original on April 17, 2005. Retrieved 2014-03-30. ^ a b "Lescharts.com – Michael Jackson – I Just Can't Stop Loving You" (in French). Les classement single. ^ "MAHASZ – Magyar Hanglemezkiadók Szövetsége". mahasz.hu. Retrieved 2012-06-13. ^ "I just can't stop loving you in Irish Chart". IRMA. Archived from the original on 3 June 2009. Retrieved 20 June 2013. Only one result when searching "I just can't stop loving you"
^ "The best-selling singles of 1987 in Italy". HitParadeItalia (it). Retrieved 20 June 2013. ^ a b c d e "Michael Jackson awards on Allmusic". Allmusic. Retrieved 20 June 2013. ^ "Hot 100 JAPAN Charts｜publisher=Billboard JAPAN". Archived from the original on August 21, 2011. Retrieved 2012-06-20. ^ "キャント・ストップ・ラヴィング・ユー マイケル・ジャクソンのプロフィールならオリコン芸能人事典-ORICON STYLE". Oricon Style. Retrieved 2012-06-20. ^ "Charts.nz – Michael Jackson – I Just Can't Stop Loving You". Top 40 Singles. ^ John Samson. "I just can't stop loving you in South African Chart". Retrieved 20 June 2013. ^ "Spanish Physical Singles Chart". PROMUSICAE. Retrieved 2013-03-25. ^ a b "Swisscharts.com – Michael Jackson – I Just Can't Stop Loving You". Swiss Singles Chart. ^ "1987 Top 40 Official UK Singles Archive - 15th August 1987". Official Charts Company. Retrieved 20 June 2013. ^ "Offiziellecharts.de – Michael Jackson – I Just Can't Stop Loving You". GfK Entertainment Charts. Retrieved March 14, 2019. ^ "Austriancharts.at – Michael Jackson – I Just Can't Stop Loving You" (in German). Ö3 Austria Top 40. ^ "Dutchcharts.nl – Michael Jackson – I Just Can't Stop Loving You" (in Dutch). Single Top 100. ^ "Gallup Year End Charts 1987: Singles". Record Mirror. London, England: Spotlight Publications. 23 January 1988. p. 36. ^ "UK Singles Chart". The Official UK Charts Company. Archived from the original on March 14, 2009. Retrieved 2009-07-06. ^ Copsey, Rob (27 August 2018). "Michael Jackson Top 60 songs on the official chart". Official Charts Company. Retrieved 27 August 2018. ^ "British single certifications – Michael Jackson – Billie Jean". British Phonographic Industry. Retrieved August 27, 2018. Select singles in the Format field. Select Silver in the Certification field. Type Billie Jean in the "Search BPI Awards" field and then press Enter. ^ "American single certifications – Michael Jackson – I Just Can't Stop Loving You". Recording Industry Association of America. If necessary, click Advanced, then click Format, then select Single, then click SEARCH. "Todo Mi Amor Eres Tú"
This page was last edited on 30 March 2019, at 08:31 (UTC).